Standard & Stainless: What is the difference? 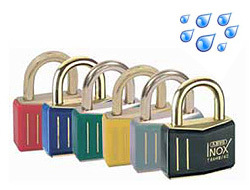 These are a genuine marine grade brass padlock as opposed to the standard types advertsised as merely "weatherpoof". 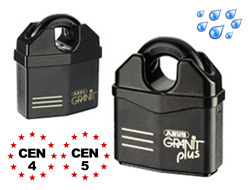 They are entirely corrosion free and suitable for use in or near salt water. They often see a lifespan in excess of 15 years. 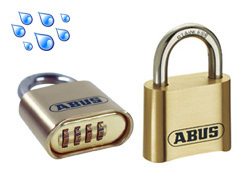 Available in three sizes with keyed alike options. 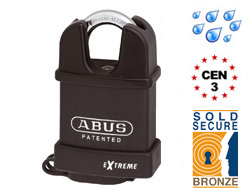 100% rust-free Abus Expedition padlock with a stainless steel shackle and internal mechanism. A protective plastic sheath provides additional protection against the elements including grit, sand and impact. We're the only company to offer this very popular range in 2 sizes! Ideal for areas that are subject to sea water and other more severe weather and environmental conditions. 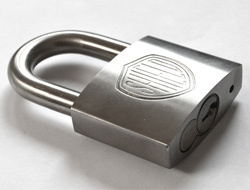 A small and practical rust-free combination padlock by the British company, Shield. 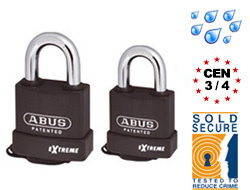 It is simple, easy to use, well priced and exceptionally weather resistant even in salt water and exposed environments! It came "Best In Test" for salt water resistance in the Practical Boat Owner review against all the other major brands. 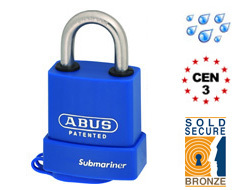 There are weatherproof padlocks and then there is the Submariner. 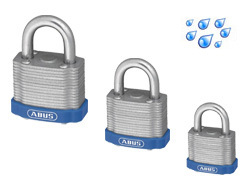 The best marine grade lock on the market tested on North Sea wind farms and approved as the most resistant lock available in saline environments. 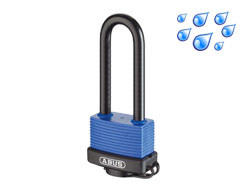 A weather resistant expedition padlock and chain set ideal for security gates and bikes. 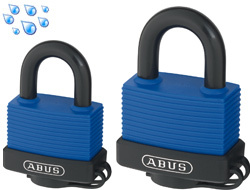 The plastic coated padlock can stand up to extended periods outdoors with added protection against grit, sand and soil. 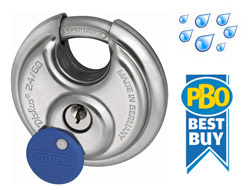 A high security stainless steel padlock suitable for all outdoor and extreme weather environments. 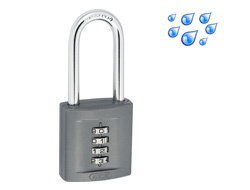 4 digits also make it highly secure as a combination padlock in any situation and can only be reset using a special security key. 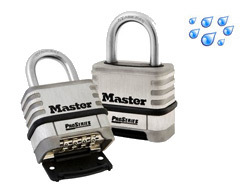 This is Masterlock's new marine grade combination padlock made from thick stainless steel including all non corrosive internal components. 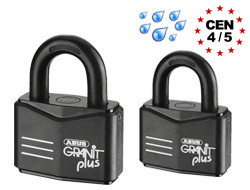 This medium security marine grade combination lock. 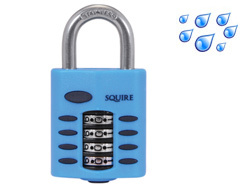 It is designed for salty air environments where normal combination locks rust up very quickly. 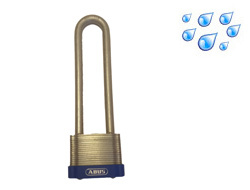 It comes in a 6mm and an 8mm shackle. 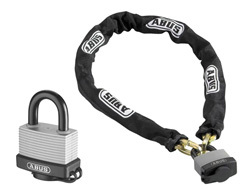 The 6mm shackle is not as secure as the ABUS and Masterlock alternatives but it is nice for the price and provides a simple but effective, rust-free solution. 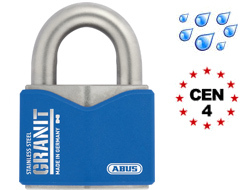 Brand new on the market and one of very few solid stainless steel locks available. 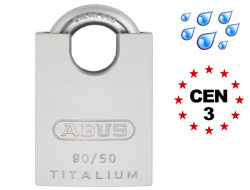 Constructed from high quality 304 stainless steel which makes them ideal for use in marine or other corrosive environments. Available with different keys or keyed aliked (same key set). 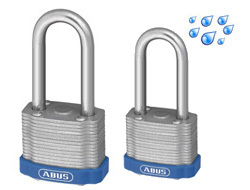 The ABUS T84 / Inox range are specifically designed using brass shackles as safety lock-off, anti-spark padlocks. They are also fully marine grade and resistant against harsh environmental conditions. Available in 6 colours. 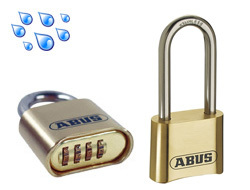 A fully weatherproof marine grade Diskus padlock by ABUS made entirely from non-corrosive materials including the 360 degree anti-cut protection of the higher security Diskus padlocks. Available in three sizes.